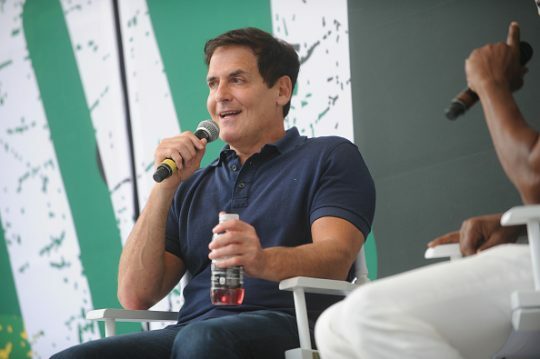 Billionaire businessman Mark Cuban said in a new interview that the Russian interference campaign "had no effect on the election" in 2016, suggesting President Donald Trump was not capable of colluding with anyone. The investigation into whether the Trump campaign colluded with the Kremlin to affect the outcome in Trump's favor has stretched throughout Trump's young presidency, but no "smoking gun" has been found. "The Russians had no effect on the election," Cuban said in an interview with New York Times columnist Maureen Dowd. "Look, if you spotted Donald Trump two pieces of bread and behind him was a refrigerator full of ham, he couldn’t collude with the Russians to make a ham sandwich. Right?" Cuban, who supported Hillary Clinton during the campaign, also mocked her for spiking the football before winning the race. "They didn’t see it coming at all," he said. "I remember right before the election, they invited me to the party in Brooklyn. I’m like, are you kidding me? You do not plan the parade before you win the championship." Cuban has stated he's considering running for president in 2020 but still says it's unlikely, telling Dowd the chances are 10 or 11 percent. Dowd's story began with an amusing anecdote: in 2015, Cuban and Trump were under consideration for the role of the U.S. President in Sharknado 3; when Trump never signed a contract to do so and ran for president instead, Cuban took the gig and Ann Coulter played his vice president. "Look, there are people who are saying we don’t need another business person," Cuban said. "But it’s about what you do with it, what you learn, what you can contribute and what value you can add. I’d want to come in with proof of an agenda, ‘Here’s a health care solution and I’ve already paid my own money to have it scored.’"
This entry was posted in Politics and tagged Mark Cuban. Bookmark the permalink.